The marriage of Prince William to Catherine Middleton is one of the most significant royal events of recent times. As second in line to the throne, the elder son of the much-mourned Diana, Princess of Wales - whose famous sapphire-and-diamond engagement ring he bestowed on his future bride - William embodies the hopes and expectations of millions of people around the world. And as a "commoner" who will become a princess, Catherine brings romance and freshness to a very traditional union. Acclaimed biographer Andrew Morton, who was trusted by Diana herself to recount her true story to the outside world, has been covering Prince William since birth. Now he brings his unique insights to this portrait of the histories and the characters of the bride and groom - from their family backgrounds to their childhood to the early days of their relationship at university, through the ups and downs as a couple in the public eye, their private engagement in Kenya, and all the glamour and drama of the wedding itself. Both a chronicle and a lasting memento of a day to remember, this beautifully illustrated book brings us the public spectacle and the private moments as only the author of Diana: Her True Story can reveal them. I've been fascinated with the royal couple for awhile now. I watched countless documentaries and TV specials about them leading up to their wedding, I was one of those crazy people who was up in the middle of the night to watch the wedding on TV, and I watched as much as I could of their Royal Tour through Canada at the beginning of July. I first saw this book in Costco - half the cost of the cover price - but I decided to wait and see if my library had it. Luckily, I was able to get it in the Fast Lane (the one week loans for new books and movies) and as much as I enjoyed it, I'm glad I didn't buy it. I learned things about William and Kate that I didn't know before. I knew a fair bit about William, being just a year and a half younger than him and feeling like I grew up with him in a way, but I didn't know much about Kate. I learned a lot before the wedding watching a ton of documentaries, but there were interesting facts about their childhoods, families, and their relationship that I didn't know before. There were dozens of beautiful pictures, not only of William and Catherine, but of the royal family and the Middletons as well. There were many pictures I'd never seen before, which was nice. It was interesting to hear from people who know the couple - friends, schoolmates, even observers. Some were close to the couple and had an inside view of their relationship as it grew, and others were casual observers, noticing things about the couple, separately and together. I thought there was too much about Prince Charles and Princess Diana. I know there needed to be some information about them - they are Will's parents after all - but it was a book about William and Kate, not Charles and Diana. It went fairly in-depth into Charles and Diana's history, and their failed relationship, and there were times when I thought it was too much. 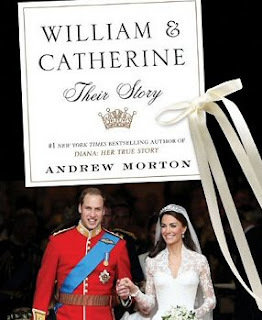 I know they had a huge impact on William's life and who he is today, and I know how their relationship affected his relationship with Kate, so I can understand why the author felt the need to talk about them so much, but I already knew a lot about them and I was more interested in learning about Will and Kate. After all, the book was called William and Catherine: Their Story - not 'How Charles and Diana's Dysfunctional Relationship Led Will to Where he is Today'. I also didn't like how the author alternately cast Diana as a hero and a villain. One minute she's William's best friend, his pillar and confidante, the next she's using him as her confidante, putting too much on his young shoulders, abusing his trust, using the media to her advantage when she claimed to hate them so much, etc. I realize no one is all good or all bad, and anyone who knew anything about Diana knew she was troubled - and why - but I didn't like how the author yo-yo'd back and forth. I've said for years that I wish people would just let Diana rest in peace, but I guess that's just not meant to be. There were a few things that I wondered about, and wondered at the accuracy of certain things. How did the author obtain certain quotes and facts? There were a lot of quotes that weren't cited; who did they come from? I had to wonder if all the 'facts' were verified, as sometimes they seemed more like speculation than facts to me. Overall, I liked this book, but more as a picture book than anything. As I said, even at half price, I'm glad I didn't buy it. I'll stick with the beautiful magazines I got after the wedding! My daughter and I watched the wedding during the wee hours of the morning too. How often can one say that they did? I saw this book at Costco as well but didn't buy it. Now I am glad I didn't. Well, I guess I'm not going to buy it. Thanks for reviewing it though. I loved this book. I had to read a non-fiction book for school and it was an excellent read. I recommend it to any middle school student needing a non-fiction book. The book isn't to hard for middle school students and the pictures helped me a lot. I wouldn't recommend it for someone older but for a teenager it's perfect.